You are a kite dancing in a hurricane, Mr. Bond. It’s a formula we’ve come to relish, and one unlike any other in title design: the women, the weapons, and Bond, tangled among it all. For the opening of SPECTRE, the 24th film in the series, Bond title design stalwart Daniel Kleinman, studio Rattling Stick, and the visual effects team at Framestore assemble a powerful mix of imagery to reintroduce the British super spy and his foe du jour. Flesh, flames, and those sticky, reaching tentacles call back to previous Craig-era 007 adventures with fleeting glimpses of old allies and adversaries. The combination, though familiar in its routine, is executed flawlessly. Coupled with Smith’s driving and impassioned theme, the sequence is easily one of 2015’s strongest as well as a standout entry in the Bond stable. A discussion with Title Designer DANIEL KLEINMAN of Rattling Stick and VFX Supervisor WILLIAM BARTLETT of Framestore. 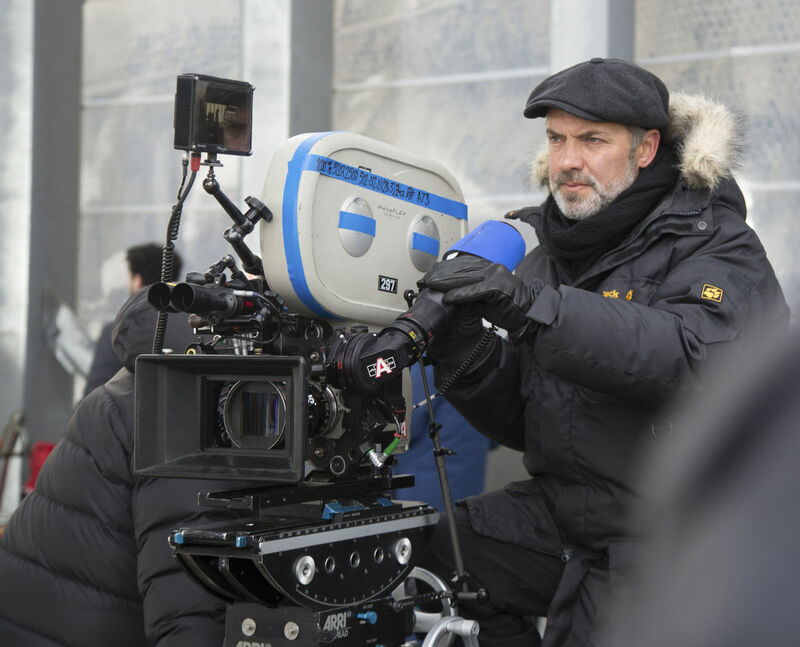 This isn’t your first rodeo with 007, but this is your second collaboration with director Sam Mendes. What was the first meeting about this sequence like? Daniel: We met quite early on. I think it was January ... I think they’d just started filming. Basically what happens is I get sent the script, I read it, brainstorm some ideas, and then pass it by Sam and the producers. 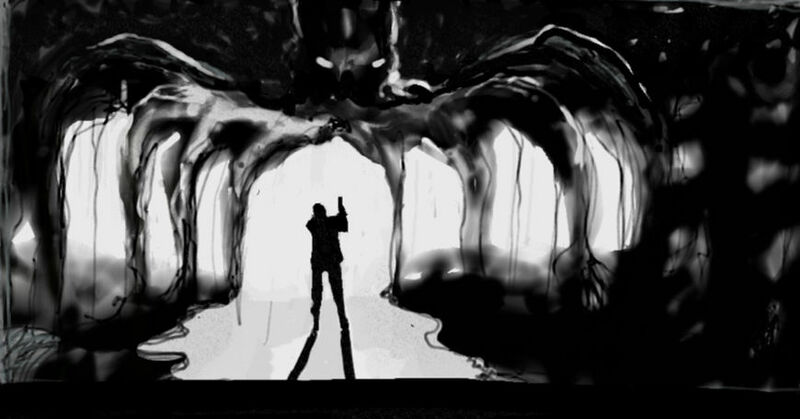 Sam had written a couple of things in the script, a couple of images that he wanted in the title sequence, just to help with the clarity of the story. So I riffed on that a bit and came up with some ideas and went and met with Sam and Barbara Broccoli. Barbara Broccoli is an American film producer best known for producing the James Bond film series. She is the daughter of original 007 franchise producer Albert R. "Cubby" Broccoli. I just showed them sketches, nothing in order or anything, literally just images that I’d sketched and put together, which he very much liked. But the script gets heavily worked on while they’re in the process of filming, so even though I’m reading the script that they start shooting the film with, it changes on almost a daily basis. They have the writers there writing the entire time. So some of the things that I was doing became not so relevant, some of the scenes changed, and so on. I have to be a little bit fluid and flexible. Is that a typical process for you on these projects? Has it been like that on past 007 films? Daniel: No. The initial thing is always the same: I get the call, I get asked if I’m up for doing it, and I say “Yes, please!” [laughs] I always read the script first. Some other directors that I’ve worked with – each one is different – some of them are just so busy and aren’t that interested in getting involved in the main title – they leave me to it. And that’s fine by me. [laughs] That sounds about right. What were the images that were there early in the script, that Sam had indicated? Daniel: One of the key ones was the use of the octopus. 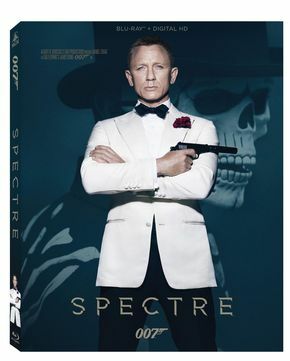 I mean, that’s fairly obvious because the logo of SPECTRE is the little octopus, but that was the key image, the key thing that made me feel that I wanted to have ideas based around it. I watched a lot of real octopus footage and I noticed that when they swim away, if they’re frightened, or they’re trying to disguise themselves or confuse an enemy, they spurt out ink. So I started doing these little drawings of octopuses flying around with ink coming out and I realized it sort of looked like bullets flying through the air, sort of trailing smoke. Daniel: Then I thought, I’m getting somewhere here, I can use that. I started thinking about making the octopus more metaphorical rather than literal. There’s that little scene with the lovers at the beginning, where you think it’s just the couple and then the octopus is sort of mingling in – it’s a sort of ménage-a-trois with a couple and an octopus, which is a bit bizarre I suppose [laughs]. Daniel: Exactly. I was trying to suggest that. So I did some drawings of couples embracing with octopus tentacles coming up behind them or wrapping around them and Sam really liked that. So once you have those initial concepts and Sam and the producers like it, what’s the next step in the process? Daniel: So that first stage is just a list of ideas and a pile of drawings. I fine tune them, I work on them, think how they could be made into moving images, how one might transform into another, put them in a sequence and try to think about what order might make them work together. 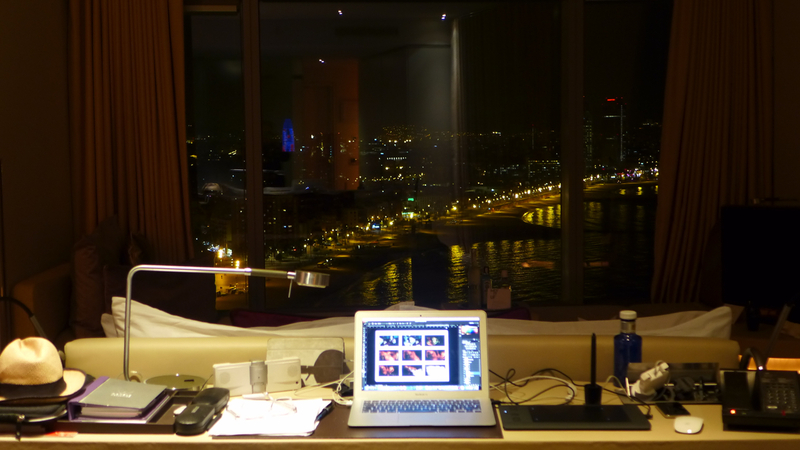 Kleinman's hotel room in Barcelona, Spain where the sequence was conceptualized. At that point I may or may not have the music, which is also a little bit of a problem because quite often that comes in rather late in the day. So I still have to stay flexible. Obviously I want it to link to the lyrics, but if I don’t know what the lyrics are… [laughs] Once I hear the music I often have to swap the scenes around quite a bit. But I try to get a storyboard order. With any luck I will have heard the song by that point – or at least an edit that will end up being the main title music. They record a song that’s five or six minutes long, which is far too long for the sequence, so that then goes off and gets edited down. I try to guess where the music edit might be, but I’m usually completely wrong so I have to change things around again. If Sam and the producers have got time or they’re in the country, I’ll run it past them again to make sure we’re all on the same page. William, you’ve worked on a number of Bond titles with Daniel now. How did you first become involved in the series? 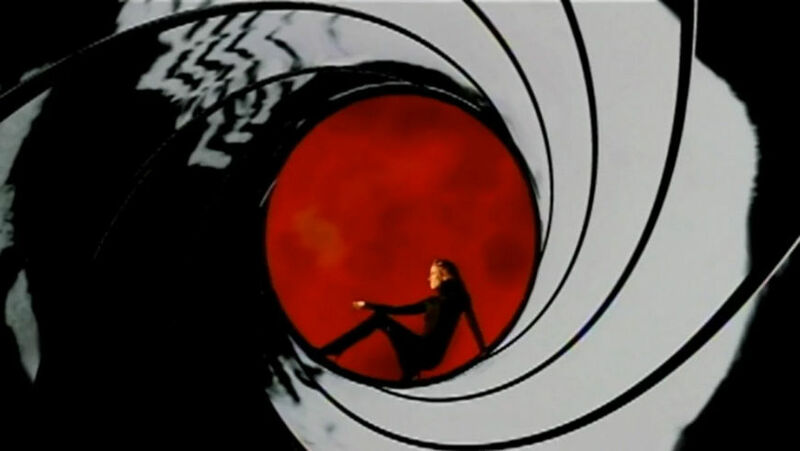 William: Funnily enough the first ever job I worked with Danny on was the music video for “Tomorrow Never Dies” – Sheryl Crow's Bond theme. Framestore had created the title sequence with Danny too, but I had not been involved as I was new and was doing other stuff. In fact the VFX for Tomorrow Never Dies and GoldenEye, the two sequences that Framestore worked with Danny on that I didn't supervise, were overseen by Tim Webber, who recently won an Oscar for his work as VFX Supervisor on Gravity. William: Although the music video had gone well, I didn't work with Danny again for a few years as I was still pretty junior and Danny was working with more established supervisors. We then started working together on several adverts from about 2000 and when Die Another Day came around I was very excited to get involved. So at what point in the process do you and the visual effects team at Framestore get involved in SPECTRE? William: Danny will usually come and talk to us once he’s read the script and had an initial think about the themes and ideas he wants to base the titles around. He has a very thorough understanding of visual effects and what we do, so he’ll already have a pretty clear idea of which bits to shoot and which bits to create in post. What are the first steps for you as the Visual Effects Supervisor? William: On most VFX work the requirements are pretty fixed when you start a job. The VFX supervisor's role is to advise on how to create the desired images through a combination of shooting, CG, and compositing, and then oversee that work. Bond is different as the ideas are far more nebulous. The first steps involve a lot of back-and-forth with Danny. He’ll go through his drawings and thoughts on the main themes and then we go away and try to flesh them out a bit. We work up concept art and look at development tests and offer up other ideas. New developments in software and processing power continuously open up new visual possibilities and so we’re always looking at what new tools we have that might bring something new. We try to share as much of this as possible with Danny so he can take it all away and refine his overall concept. Daniel, once William and Framestore are on board, what happens next? Daniel: The next process is shooting elements in the studio. I often have to do that in two parts, particularly if I want one of the actors. If I want Daniel Craig in the sequence I have to wait until the movie is finished filming. So I film all the bits I can because I have to get going. Sometimes I film a double of him so I can get on with the edit and work out what he does. Then I get a day with him right at the end of the main film schedule, I film the bits of him, and I sort of slot them. Do you have a go-to Daniel Craig double that you use for all the sequences? Daniel: [laughs] No, I don’t. It’s quite difficult to find one, actually! I used his stunt double from the movie, Bobby Holland Hanton, who happened to be around when I was filming. I was able to have him for a day. But the thing with Daniel Craig is that he’s very, very idiosyncratic. The way he moves, the way he looks, the intensity of his presence – it’s very difficult to emulate. Even sort of running around pointing a gun, you notice that it’s not him if it’s someone else doing it. The double is literally just a placeholder until I can get Daniel. Using dancers takes it one step away from reality, makes it more artistic and less literal. Were you able to work with any of the other actors? Léa Seydoux? What does the casting sheet look like when you put out a call for these doubles? “Must resemble Daniel Craig and be good with octopuses”? Daniel: [laughs] Well, we do a casting session that’s like anything else. I mean, it’s slightly embarrassing, you get these two people who don’t really know each other, get them to smooch a bit and to pretend that there’s an octopus in between them. [laughs] It’s really quite a surreal casting session. I use dancers mostly because actors wouldn’t really get the movement that you need. Dancers are more sensitive to it. There’s a bit where one of the guys I used sort of strokes his hand around the shoulder of one of the girls and that’s rather sensitively done. I think using dancers takes it one step away from reality, makes it more artistic and less literal. You get these two people who don’t really know each other, get them to smooch a bit and to pretend that there’s an octopus in between them. How involved is the VFX team in the studio shoot? William: We are very involved in the shoot – and not just because of the girls! We tend to shoot a lot of elements, too. 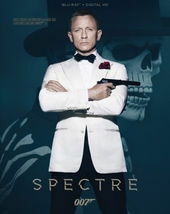 For SPECTRE we shot a lot of ink in a cloud tank – water elements and burning photos, for example. The first edit tends to be pretty rough as so much is dependent on post work to get a proper sense of how long shots should be or what they’ll look like. A good deal of the shots are totally created in post and so they’re often still storyboard frames when the first edit is put together. Tell us a bit about the production teams at Rattling Stick and Framestore. Who does what and how do you work together? Daniel: Well, it’s morphed over the years. In the old days what I used to do was film the sequence and then edit it in a non-digital, analogue way, and then it’d be copied in high resolution. That was how I did it on GoldenEye – that was the technology at the time. 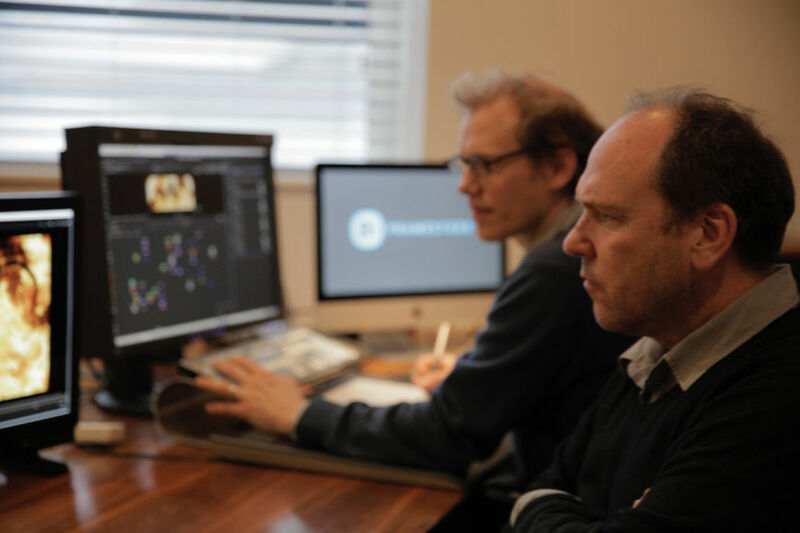 You’d just sit there and do it all with an editor, but these days the technology is so advanced that all that side bit – the special effects – they take a long time and a lot of people, in lots of different rooms at Framestore. Daniel: My company puts the shoot together, puts all the logistics together, films it, and does all the liaising, and then once I’ve edited the pictures together roughly in sequence to the music – it would be very, very basic because we wouldn’t have done any of the special effects – then it goes to Framestore. I discuss with William about what I expect each scene to be like. It’s just a couple kissing in front of a blue screen or whatever it is and then I explain what’s happening, what I think the background should be, if I want to put a camera move on it, where I want the CG octopus to come around, and then we work on it together for a good thirteen months. Daniel: It is. But I don’t work on it exclusively myself. I do other things because it can take up to a week to create and process one very complex sequence, so I can’t sit there twiddling my thumbs, drinking tea while a computer is chugging through for a week. I’m doing other things at the same time. But for Framestore it’s a massive job. They pull in practically everybody in the building and everyone’s working on some part of it. The amount of effort they put in is in no way commensurate to what they get paid for it. They do it for love. That seems to be par for the course in the VFX industry these days. Daniel: I think the whole thing with the Bond series is that it’s such a wonderful, lovely, iconic thing to be a part of, that everyone just enjoys doing. A lot of these folks are not just technicians, they’re artists and designers in their own right, so I try to let them have input. Sometimes they do add things which I don’t expect, and I like it. Sometimes I don’t. “No, I don’t want that!” [laughs] But I keep an open mind. I try to keep the process creative enough that everybody feels like they can contribute. There’s a number of elements from other Bond films in the sequence – images of deceased characters like Vesper Lynd, M, Silva, and Le Chiffre. How was that handled, and what sort of challenges did getting that footage pose? Daniel: That was actually one of the ideas that Sam wrote himself – a two-line description of what he imagined to be in the titles – to reprise some of the characters from the previous films. To sort of help people’s memory, if they’ve seen the previous films, who Silva was from Skyfall, that Vesper is from Casino Royale – even though that wasn’t one of Sam’s movies. To remind them that M is dead. Just to take little moments with those characters. I think it fit in with the lyric about fragments of memories. So I did use bits of footage from those movies for that. Image set: Raoul Silva, Vesper Lynd, Le Chiffre, and M, as they appear in the SPECTRE title sequence. Daniel: I wanted to go back to the rushes and use shots of those actors which hadn’t been used in the films, so that they were fresh. But we ran into all sorts of contractual problems about using performances that weren’t in the movie. I just didn’t have time for all that. So I just thought, alright, I’ll just find good bits from the actual movies. I manipulated them, cut them out and changed them, so it wasn’t just literally a shot from the previous film. I tried to make it a bit more interesting. Let’s talk about the music a little bit more. Radiohead recorded a version of the SPECTRE opening and released it online recently. Was that ever part of the conversations you were involved with? Daniel: I haven’t heard it! I think I did know that they’d done one, but I hadn’t heard it. Is it any good? The reaction seems to be split. We like it. It’s interesting to hear them riff on a Bond main title theme. Daniel: Oh, really? No, I was never involved with that. I did hear quite early versions of Sam Smith’s song. 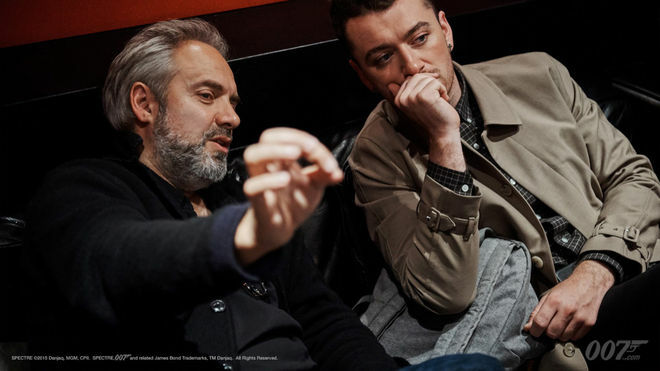 I know that Sam Mendes wanted to change some of the lyrics, which I think Sam Smith was fine about doing. In true Sam Mendes style he wasn’t scared about getting in there, changing it, and doing his thing. Which is good, it shows that he cares. So do you prep the teams with reference material? You know, give them some octopus footage to watch or tell them to go look at Hokusai’s The Dream of the Fisherman’s Wife… What do you do in that respect? Daniel: Absolutely! Yeah, we get loads of reference. We look at the reference as we go into this. One of the slightly blind alleys we went down to begin with was that the octopus was quite realistic. It could almost have been a nature program octopus. The guys that do the CG animals at Framestore, they’re used to making animals for adverts or a movie or whatever, and so they are trying to make it as absolutely realistic as possible so that it doesn’t look CG. Whereas actually making this a realistic octopus was not right – we could see immediately. It looked like a real, just-come-out-of-the-sea type octopus. It just didn’t work. It wasn’t really that ominous and didn’t seem to fit in, and so we had to stylize the octopus, make it a bit more of a kind of emblem. It was more the logo come to life than a real octopus. William: It was a major technical challenge due to the extraordinary way octopuses can move. Anyone involved in animation or rigging – the process of setting the controls and defining the movement parameters of CG objects for the animators – will have a pretty good idea of the kind of challenges we faced. It can squash and stretch, slither, move like it’s controlled from the tip – inverse kinematics – or like it’s controlled from the base – forward kinematics. They’re strong and powerful and at the same time delicate and cloth-like. I have never worked on a project before where the rigging finished after the animation! William: Aesthetically, too, we took a while to find the right vibe. The original way it was lit and rendered was based on trying to make it look “real” but as if it was underwater. 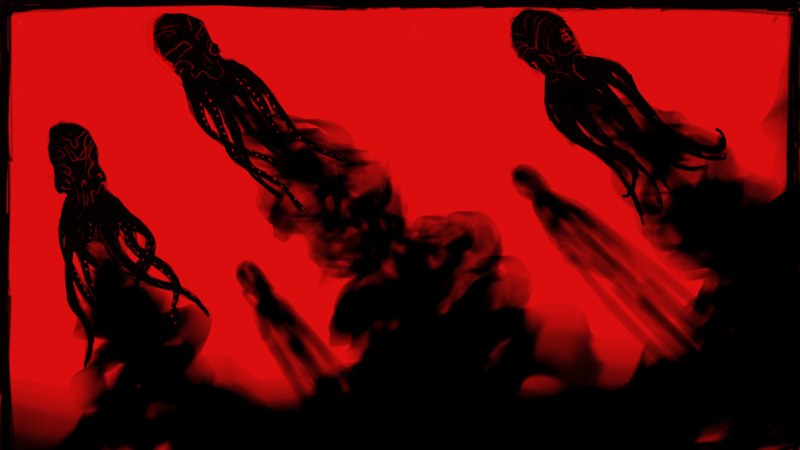 The way we were animating it suggested it was underwater and so we took that as the starting point for the look, too. Although it looked beautiful and real it did not look especially menacing and frankly not appropriate as the metaphorical embodiment of a global crime organization! Danny directed us to go much more towards a black slimy look that seemed much more sinister and was much more successful. We expected the octopus would be tricky and it certainly turned out that way! What cameras were you shooting on and what software was used to create this? Daniel: In terms of equipment, we hire in the crew, I direct the crew, but we don’t actually have equipment ourselves. When I’m editing at home I just use Final Cut Pro. We shot on Alexas, digitally. My DP, Franz Lustig, liaised with Hoyte Van Hoytema, the cameraman on the main film, to try to make the look and the colour space match. But the main film was being shot on film and we just couldn’t shoot on film. It wasn’t practical for us to physically shoot on film because of the number of special effects needed. So we tried to make the footage from the Alexa cameras look as filmic as possible. William: We shot mainly on an Alexa with spherical lenses, as we were going to be doing a lot of manipulation and so wanted the maximum information we could capture. We added in a lot of depth of field to match into an anamorphic style, oval bokeh, as well as sampling lens distortions and other aberrations including grain. The main weapons of choice were Nuke and Houdini. There were some bits and pieces done with Maya and the titles themselves were prepared on Flame. We also used Hiero as the editorial hub. How big was Framestore’s team on this? Daniel: My job is really to try to keep everybody on message, to head towards the same direction. You’ve got so many different people working on it, you just want to keep everybody focused on creating the same end result. Daniel: It is. It’s amazing. It really is. Is there a specific shot in the sequence that you’re really happy with? William: The thing I am most happy with on this and the other sequences I have supervised is the balance and consistency of the overall aesthetic. Daniel: I thought the bit with the lovers and the octopus's arms coming ’round them just had the right level of sensuality but creepy weirdness to it. I was quite pleased with that. It’s kind of attractive but repellent at the same time. [laughs] Actually, this one bit that the producers and Sam just wouldn’t let me do – at the end of that little sequence with all the lovers kissing and the octopus, there’s this close-up of two mouths coming together. Originally I was going to have the girl’s tongue coming out of the girl’s mouth going into the male mouth, but it wasn’t a tongue, it was an octopus tentacle. And they all just went, “Yeccchhhh, that’s too much!” So that hit the cutting room floor! [laughs] I’d gone too far! Your work has made you experts in this field, so let’s talk a little bit about the history of the series. Looking back at past Bond titles, do you have a personal favourite? Is there one that you think doesn’t get talked about enough? Daniel: Oh yeah! There’s so many of them that I think are brilliant. I love them, I loved them as a kid. I still think my favourite is You Only Live Twice, which I just think is a really beautiful sequence. It’s my favourite song of the Bond title songs. I just love the Japanese imagery, the colours, the volcanoes, the geisha girls, and the clever way Maurice [Binder] got the parasols without paper on them to open up like flowers or explosions. So it’s just a really great sequence. William: A View to a Kill always sticks in my mind. It might be the mad image of a woman skiing on top of a bonfire, it might be the classic mid-’80s styling, or it might be the way the 007 logo is revealed. Daniel: It’s an amazing heritage. I don’t do any other sequences, you know, I do Bond because given the choice you can’t not do it. It’s part of film history and it’s a privilege to be doing it. Advertising, film, television, sound, graphic design, interactive, visual communication – they're all here in one place.